Since we are at the beach and can’t get into our swimsuits I made something for my little one while she was sleeping. 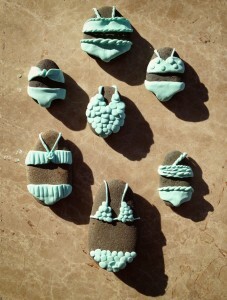 I just used Fimo molding clay and then baked them for the directed amount in the oven on top of the rocks. I Had a fun time coming up with different suit styles.